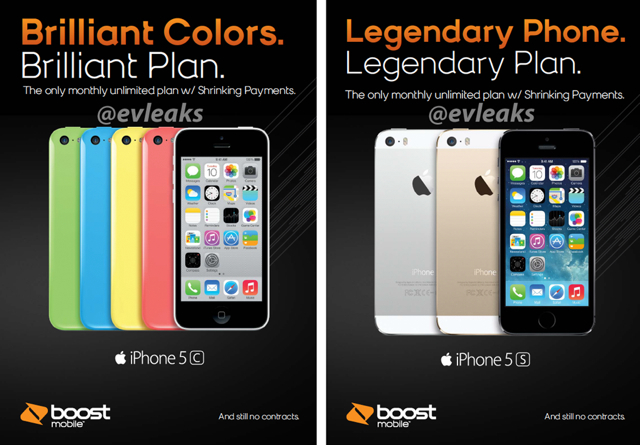 Sprint has announced that Boost Mobile will get the iPhone 5s and iPhone 5c on November 8th. Posters advertising the devices for the carrier had previously been leaked; however, this is the first official confirmation of the news. Boost Mobile, a leader in the no-contract wireless industry with its exclusive Monthly Unlimited plan with Shrinking Payments, today announced it will offer iPhone 5s, the most forward-thinking smartphone in the world, and iPhone 5c, the most colorful iPhone yet, to customers beginning on November 8. For more information please visit: www.boostmobile.com/shop/iphone. For more information on iPhone, please visit: www.apple.com/iphone.